Our Document BOT is Self Learning, Intelligent Document Parsing software used to identify documents and extract meaningful information with greater accuracy, reducing the need for manual checks. Transform your unstructured data like KYC Documents, Invoices, Balance Sheets, Bank Statements, Deposit slips, Enrolment forms and many more into structured information, while the BOT automates your document workflows. theDigitalworkers's Document BOT helps the users with document understanding, while it personalizes and automates the document processing process. Hundreds of vendors with multiple invoice formats can be fed into the Document BOT to parse and extract information from invoices, and auto-feed into an ERP/ Accounting system, for further processing. The intelligent automation in information extraction from scanned and computer generated PDF documents, and subsequent automation of data entry to third party systems like ERP/ HRMS/ Accounting Systems/ CRM etc.. will provide for immediate return on investments, while boosting productivity and faster turnaround times for transaction execution. This will in turn provide for happier vendors and various stakeholders. theDigitalworkers's DocuBOT takes input in the form of PDF files, and generates output in Key:Value pairs in various formats. 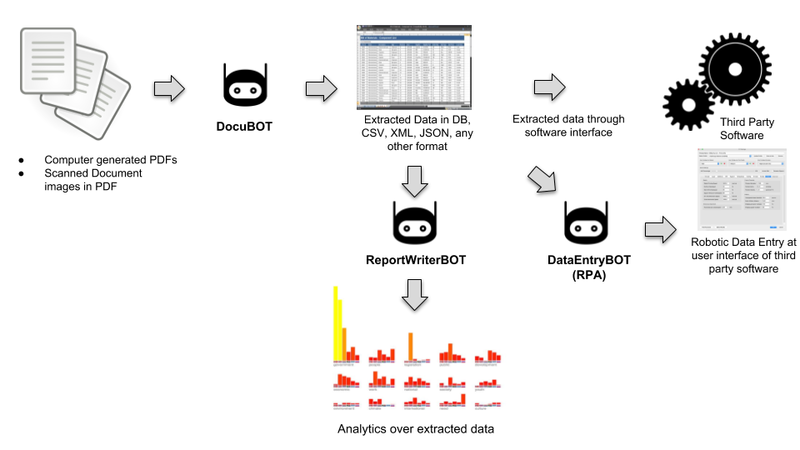 It is a Self Learning BOT, and can be easily trained to identify documents, recognise templates, and extract information that is relevant by feeding multiple copies of a similar type of document. For example, DocuBOT can be trained to recognise invoices from a vendor, by simply feeding in 20-30 invoices from the vendor. DocuBOT learns the format and information placements on invoices, on its own, and becomes trained to work on the document from this vendor. Serve your customers better with TheDigitalWorker's Help Desk Automation and how? To train the DocuBOT to understand a set of documents from a particular source, just feed it upto 20 documents of the same format, in one go. Bulk documents can be processed in seconds. Our DocuBOT running at a large MNC in Bangalore, processes 3000+ invoices in 7 seconds. 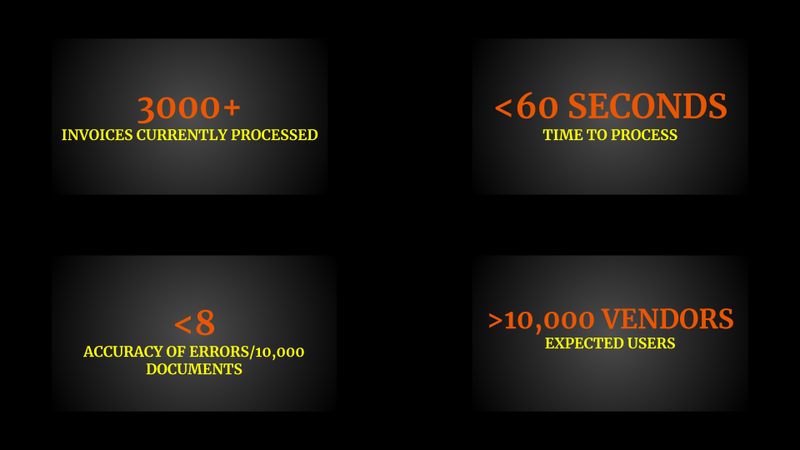 So far, the accuracy of the DocuBOT has been about 8 errors in 10,000 invoices. Errors are data points that are not understood correctly, due to the quality of scan. These could also be data which are treated as invalid/ unspecified format, by the third party system where it is being entered. A large MNC processes all back-end Accounts Payable process for its Global operations (199 factories in 150 countries) from Bangalore. The back end teams manage vendors and process several thousand invoices everyday. The invoices come in multiple formats, languages and currencies, and it takes over 8 hours for a person to process a couple of hundred invoices. Our DocuBOTs aided with VisionBOT, are able to self learn and detect whether a document is an invoice, bank statement, KYC etc. It also learns that an invoice is from a particular vendor by identifying the format of the invoice. ROI: Immediate. DocuBOT extracts all necessary information from an invoice in seconds and sends this data to the SAP finance back-end. DocuBOTs currently process over 3000 invoices in a few minutes, with an accuracy of less than 8 errors in every 10,000 documents. The system is being trained to handle several thousand additional vendors everyday.